Back in “HalloVeen,” Brooklyn Nine-Nine’s resident Boyle doppelgänger/Gina impersonator/creep Bill found a way to sign both Boyle and Jake up for a vitamin pyramid scheme. Boyle joined because he’s Boyle—he wasn’t a hard sell. Jake, on the other hand, joined because it was the only way Bill would allow him to move on in the Halloween Heist, and Jake really needed to make sure everything was perfect for his planned proposal. I didn’t even mention this particular aspect of the episode in my review, because what could be more throwaway than a couple of main characters joining a very minor character’s (one who only shows up for Halloween Heists) pyramid scheme? At most, the show would probably mention it again in passing, right? Obviously, “NutriBoom” proves that line of thinking wrong. 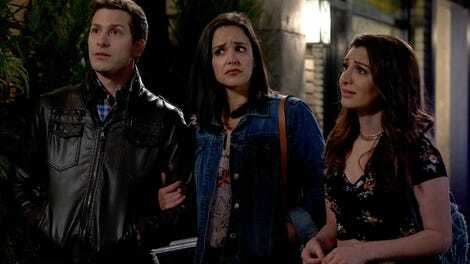 Somewhere in between the levels of Brooklyn Nine-Nine bringing Jake’s Addams Family rap back in “The Box” and announcing the results of Amy’s Sergeant exam in “The Puzzle Master” is “NutriBoom.” And looking back now, it actually makes sense Brooklyn Nine-Nine would go back to that little pyramid scheme. After all, the Halloween Heist episodes have reached a point where the Nine-Nine crew is so consumed by the competition that they certainly wouldn’t stop during it to investigate something as troubling as NutriBoom at the time. Keep in mind, “HalloVeen” even included the bit about the founder’s wife being happy and healthy, a red flag that this episode acknowledges. “NutriBoom” is the tighter and more balanced of the two episodes of the night, though its A-plot requires Jake and Boyle to do some atypically shady things in order to go further down the NutriBoom rabbit hole. They break into and steal the company’s—poorly secured—financial records in order to look for anything resembling actual crime-doing. It’s certainly not the same as getting a warrant, because chances are they couldn’t get a warrant. Because even finding a presumed dead woman, they still can’t prove any actual crime, just wonky contracts. Also, it’s kind of hard to believe that Jake and Boyle just fall into an intense criminal conspiracy all of a sudden, going from a throwaway line in an earlier episode to a case that even the FBI can’t crack. It’s certainly not the type of plot where you want to think too hard about the entire case around them, because the “Boom Boom” and the Scientology aspects of it all are funny enough to distract from how genuinely overwhelming and terrifying they also are. The episode ends with Jake (as well as Amy and presumably Boyle) now in the cross-hairs of NutriBoom, and it’s… Well it’s really a lot to take in for what at first appears to just be a superficial plot. But a superficial plot wouldn’t have Jake lose his and Amy’s honeymoon money ($10,000) to a super corrupt corporation, would it? The other plot in this episode (Sergeant Amy) is relatively grounded in comparison, but it’s still fun enough and gives everyone else something compelling to do (even mostly as sounding boards and brainstormers) while the dynamic duo tries to take down an evil corporation. This plot is officially our first look at Amy as Sergeant, with full Amy-ness on display both in the form of Amy’s nerves about her new position and with Drew Tarver as Officer Gary Jennings. Before the characters even get to the official discussion of “the Amy”—but after I’d already gotten excited to see Drew Tarver—I wrote in my notes, “is Gary the Amy?” It’s a simple plot but fun one, as well as one that relies on seasons of watching these characters “handle” Amy in the first place. With the shoe on the other foot, Amy gets her first big challenge as a Sergeant; but once she’s on top of it, she’s just as great of a boss as anyone... would expect. Going back again for a moment: It was in “Two Turkeys” that Jake’s father revealed that he’d fathered three daughters, thanks to his life as a traveling lothario. As mentioned here in “DFW,” Jake apparently reached out to all three half-sisters, with the ones in Atlanta (“ATL”) and Newark (“EWR”) not responding; but as he says about the third in Dallas, “DFW is DTM—Down To Meet.” And “DFW” is otherwise known as Kate Peralta (Nasim Pedrad). Kate Peralta is a lot to take in a one-episode dose, and unfortunately—both because of how much she is and because she’s played by the always wonderful Nasim Pedrad—“DFW” has to hit a lot of beats quickly just to hit them. Unlike in “NutriBoom,” the rest of the episode isn’t all that full outside of the A-plot—even with two other subplots and things like Terry Crews’ beautiful physical comedy—so there’s nothing really to balance just how off the rails the Kate character is. Kate is too much of a mess to enjoyably stick around for multiple episodes in a row, which is of course disappointing because of the Nasim Pedrad of it all. Speaking in terms of character dynamics in this episode, it is a bit disappointing to go from an episode with a career-focused Amy plot right to one where she’s essentially the disapproving girlfriend. Her role here is to keep Jake focused and prevent him from letting his sister’s messiness transfer over to them, but Jake—as much as he wants to give Kate a chance—is really able to handle this one all on his own. Just like he’s able to realize how both he and Kate are like their father, just in different ways. While Terry, Gina, and Rosa (and even Holt) were all idea machines for Amy in “NutriBoom,” they were still important to the story. Amy’s role here sadly isn’t that important in comparison. Except for in her pen pal Mongkut stories. That’s some darkness that works. And there is a lot happening in this plot, with Jake and (especially) Amy’s main roles here mostly coming in the form of reacting. “Reacting” is actually the driving force of “DFW,” whether it’s Jake/Amy to Kate’s whirlwind of a life or Holt/Boyle to Terry’s need to prove his existence as a “yoga beast” or Rosa to Gina’s choices in women to set her up with. For example, the Terry/Holt/Boyle plot begins because Holt needs to be “more active,” but that’s merely just a point included to lead us to a broken Terry. And really, the point is to lead us to the An Officer And A Gentleman riff. There’s not much going on in this plot, but I can’t and won’t deny just how much Terry Crews gets to shine with his physical comedy. The way Terry falls forward to grab Scully’s shoulders and beg him for help is an absolute work of art. That’s the thing about this episode: For as much or as little as anyone gets here, they all knock it out of the park. It’s just a kind of empty park, especially in comparison to the first episode of the night. “DFW” is also the episode where we check back in with Rosa’s love life, as we (and Gina) learn that she broke up with her girlfriend “Becky” (the name the NIne-NIne made up for her) because she ate soup too much (twice). While this episode is notable for introducing a new brother-sister relationship, it’s also pretty good about showing Rosa and Gina’s friendship. As they both acknowledged when Rosa came out, they would’ve made a pretty hot couple in another life. In this life, they merely settle for a dope friendship where they can bond over a Holt soundboard and just how selective Rosa can be when it comes to who she dates. Rosa and Gina are the two most “too cool for school” characters on the show, so it’s nice to see their relative chill compared to the rest of the episode. Episodes like both “NutriBoom” and “DFW” really lend themselves to the theory that the Brooklyn Nine-Nine writers know or at least are working with the idea that the show’s not going to be on for much longer (or even make it past this season). There’s no need for as many seemingly inconsequential follow-ups and callbacks as there have been lately. Yet these past few episodes feel like they’re really working hard on bringing everything back together—and reminding the audience just how large the Brooklyn Nine-Nine world is—as the season comes to a close. There’s nothing wrong with that at all; it just really makes one stress out a little more about the end being sooner than anyone would like. This week in webisodes Brooklyn Nine-Nine needs: Ocean’s Nine-Nine. I get Boyle’s Elliott Gould choice, even if Jake doesn’t. Also, Kate’s video diary as she prepares for The Voice debut. Between “Operation Saving Private Pigeon” and the “I Want It That Way” line-up, the latter wins the battle of cold opens. Especially with how quickly it cuts to the opening credits after Jake returns to reality. (“Aww, chills. Literal chills.” “It was Number Five. Number Five killed my brother.” “Oh my god, I forgot about that part.”) The former deserves props for just how elaborate Jake’s plan is to release the bird… only to immediately end up with a dead pigeon. Bill: “Let’s start with my whole family history: I was abandoned in a playground as an infant, and here I am.” Bill is like a version of Boyle that never got smothered with love and attention from his family. And the weirdness Boyle feels with Bill is the way a lot of people feel about Boyle, only people know Boyle isn’t going to chop them up into little pieces. You can’t be too sure when it comes to Bill. Amy: “Gary will never find love. He is unlovable.” Rosa’s eyes go wide at that one. The way Boyle lights up over June 10th being his dad’s birthday is a pure moment.